Nicaragua is now in its third month of civil unrest. According to the Nicaraguan Association for Human Rights (ANPDR) 351 people—mostly youth—have been killed, 2100 injured, 329 kidnapped by paramilitary, 68 tortured, 261 disappeared and still missing, and the numbers grow daily. Bloodshed, combined with the fact that many hospitals are prohibited from treating the wounded, has resulted in an unprecedented medical crisis for which there is an urgent and immediate need for our support. I am a thoracic surgeon. In one month I have treated more patients than I normally do in two years. It is heartrending to see kids come into the emergency room, bathed in blood, carrying a friend with a collapsed lung, exhorting him to hang on, forgetting their own injuries and ignoring their own pain, in a desperate attempt to keep their friend alive. The impotence I feel as I work to save the lives of these victims of the ongoing massacre waged against them by government forces, is almost unbearable. Where as the government has prohibited many hospitals from treating the injured, the hospital I work at does not turn anybody away. Consequently we are overloaded and constantly running out of essential medical and surgical supplies. Even after we have successfully controlled the initial injuries, patients die for lack of medicine. 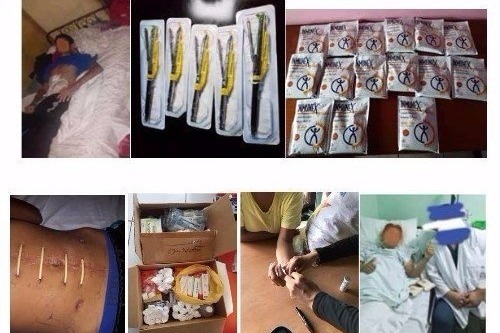 We urgently need antibiotics and indispensible medical supplies. The massacre continues but our young people refuse to abandon their barricades. With each passing day, more and more Nicaraguans join them with the hope of creating a New Nicaragua. We need the support of everyone who cares, to help us save the lives of our Nicaraguan youth. I am a physician, and a professor at UNAN’s (National Autonomous University of Nicaragua) medical school, who has always supported our students in their fight for university autonomy. Today, however, we are fighting for something else. Today we are fighting to save the lives of wounded young people. By “we” I am referring to a committed group of doctors, with a wide range of specialties who have been treating the victims of government violence. We are reaching out for support, because we have already exhausted our own resources and those of our close friends and families. Many of us have brought injured students to our own homes in order to avoid infections. We have many injured students who don’t need hospitalization, but need continued care. We have to cover the cost of this care ourselves, which is why we need your help. Right now there are 10 young people in the Manolo Morales Hospital with open fractures. Tomorrow there will be more. They need antibiotics and painkillers, but there aren’t any in the hospital. We are in crisis. The genocide continues, and we are without resources. We are a group of friends with solidarity ties to Nicaragua going back to the 1980s. Through trusted friends, we are able to funnel donations to the above referenced group of doctors who are treating the injured in hospitals, in the trenches, and even in their own homes. Our Nicaraguan friends have reached out to us, so we are reaching out to you. Your donation will go directly towards saving young Nicaraguan lives. We ask you to share this with at least 3 friends with a personal note saying that you have donated to this campaign. We also ask you to post it on social media. We promise to keep you updated on how (and where possible, who) your donations have been able to help. Because the crisis in Nicaragua has not received much coverage in the U.S. media, we are including links to several articles, for those of you who would like to deepen your understanding of recent events. Nicaragua se encuentra en su tercer mes de disturbios debido a la crisis política que atraviesa el país. Según la Asociación Nicaragüense de Derechos Humanos (ANPDR) 351 personas han sido asesinadas, 2,100 heridas, 329 secuestradas por paramilitares, 68 torturadas, 261 desaparecidas, en su mayoría jóvenes, y las cifras crecen a diario. El derrame de sangre, sumado al hecho de que muchos hospitales tienen prohibido atender a los heridos, ha desencadenado una crisis médica sin precedentes que necesita urgente e inmediatamente nuestro apoyo. Soy Cirujano General, especialista en cirugía de tórax. Cuando regrese de mi especialidad, nunca imaginé que en un mes atendería a muchos más pacientes de la que atendí en 2 años. Es desgarrador ver a los chavalos entrar con el pulmón colapsado en la emergencia con todos sus amigos bañados en sangre y hablándole para que resista, muchas veces también están heridos, pero sobreponen su dolor para que su compañero no muera. Es indescriptible el dolor y la impotencia ante la masacre cotidiana de los Ortega Murillo. El hospital para el que trabajo permita que se atiendan todos los heridos y traumatizados. Los materiales médico quirúrgicos se agotan o no están disponibles Se mueren nuestros pacientes después de hacer control de daño por falta de insumos médicos. Los antibióticos están faltando. Hemos recurrido a todas la personas conocidas y cercanas para que colaboren en la compra de insumos medico quirúrgicos para salvar vidas Nicaragua se quedará sin jóvenes. La masacre continúa y ellos no abandonan sus trincheras. Cada día qué pasa más nicaragüenses nos involucramos y comprometemos con la causa social y cívica que nuestros jóvenes universitarios han iniciado con la esperanza de tener una Nueva Nicaragua. Necesitamos apoyo!!! Soy médica y docente de la UNAN, he acompañado desde siempre a los estudiantes en su lucha por la autonomía universitaria y hoy más que nunca estamos luchando para salvar sus vidas, sus heridas. Estamos buscando los recursos , ya hemos agotado los niveles cercanos, hay muchas colegas y digo colegas, por que somos mujeres médicas de todas las especialidades la que nos hemos llevado un herido a nuestras casas para cuidarlos y evitar infecciones. Hay muchos heridos que no necesitan hospitalización y que debemos seguir cuidando. Tenemos necesidades que se salen de nuestras manos con materiales especializados de costos elevados. Hay 10 jóvenes en el hospital Manolo Morales con fracturas expuestas y fijadores externos que necesitan antibióticos y analgésicos, el hospital ""NO TIENE"", estamos entrando en crisis, el genocidio continuará y ya no tenemos recursos, tenemos farmacias que nos apoyan con los descuentos, tenemos amigos que nos donan materiales de primeros auxilios, pero ya no es suficiente. Es urgente tener ayuda para seguir apoyando a los jóvenes. Somos un grupo de amigos que se solidariza con Nicaragua desde la década de los 80. A través de amigos de confianza podemos canalizar donaciones a los grupos de médicos voluntarios mencionados anteriormente que tratan a los heridos en hospitales, en los tranques, universidades, e incluso en sus propios hogares. Nuestros amigos nicaragüenses nos piden apoyo, por lo que pedimos el apoyo de ustedes. Tu donación se destinará directamente a salvar vidas de jóvenes nicaragüenses. Te pedimos que compartas esto con al menos 3 amigos con una nota personal que indique que has donado a esta campaña. También te pedimos que lo publiques en las redes sociales. Prometemos mantenerte actualizado sobre cómo (y en la medida de lo posible, a quién) han podido ayudar tus donaciones. ¡Gracias por tu solidaridad y apoyo! This will be our final update, letting you know that we are officially closing this GoFundMe page. Your incredible response to this campaign of cooperation with Nicaraguan doctors helped to save many lives at an unanticipated and critical time in Nicaragua’s history. Through our collective effort we raised an amazing total of $12,002, the majority of which was raised in the first month of the campaign. Despite many challenges, we are pleased to inform you that all of this money (minus the $404.41 fee charged by GFM) has safely made its way to the group of doctors we have been working with. We thank you all again, hoping that you all appreciate the significant impact your cooperation has made. Below is the most recent communication we received from our friends in Nicaragua. The solidarity and humanitarian support you have shared with us as we confront our current struggle is amazing. Your joining us as sisters and brothers in this most challenging of times, lets us know that we are not alone, and knowing this, knowing that we can count on your support is what helps us go on. We are living through unbelievably stressful times. Many young people are in hiding and being protected via organized channels. But there are many others who are outside of these networks who find safety among others of us who see them as our “nieces and nephews”. Right now, there are six young people in a single house, four of whom are wounded and healing. We have to move them every two or three days so that the doctor who comes to care for them will not raise suspicions among neighbors. We have extended their stays when it is necessary for them to be with their doctors. The families of these 6 youths all live in different cities. Their families communicate with them leaving only brief voicemails on burner phones. Today was exceptionally scary. The police were patrolling near one of the safe houses at 2:30 in the morning. Our young people became aware of this because of barking dogs. The police passed by this street twice. Fortunately nothing happened. The next day everyone was moved to another shelter. Three of the injured youth are recovered and hoping to get out of the country. One of them is in a cast. We were able to take an X-ray and an orthopedist came to the house. The cast will be removed in 6 weeks. Until then, he will be under medical supervision, staying with an “aunt” who will take care of him until he is able to travel. The three young people who have recuperated have to keep constantly on the move. They need to leave the country, as the level of ongoing persecution does not permit them to stay The two young people who were not wounded finally returned to their families and have been living with relatives in another city. Finally, they are in another country, hoping to receive the asylum that will protect them. Being outside the country is not a guarantee, but at least we know they are out of the immediate grasp of the Ortega-Murillo regime. 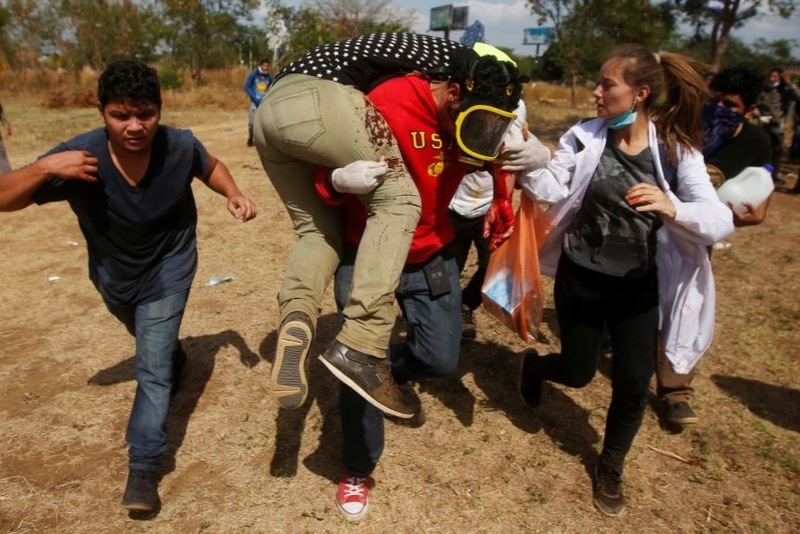 Now, during this difficult stage of persecution of these young people, as well as their families and the doctors who are facing massive firings, we continue to maintain the network of emergency medical attention that supported the victims of the government’s massacre and genocide. We continue with all the security measures, like changes of location and variable schedules, to strengthen our network, including those who provide logistical support and security, in addition to those who provide medical care. We also care for the victims’ family members, like mothers with psychological trauma, high blood pressure and cardiac problems due to the uncertainty and fear for the lives and safety of their daughters and sons. All of this work has been possible because of the expressions of solidarity that we have received from you who recognize that our struggle is a just and necessary one. Our gratitude goes out to all who have involved yourselves in this struggle: gratitude in the name of all those affected, of their family members, and of those who make up the network of medical and social care. 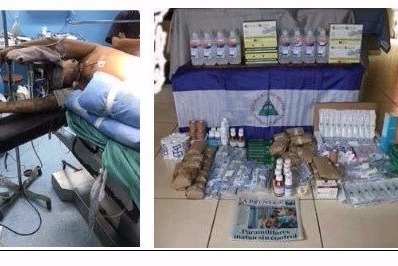 Thank you for your patience in waiting for this update – the situation in Nicaragua has not improved, and the doctors have been extremely busy saving lives with your money, providing emergency humanitarian medical assistance to victims of the Ortega-Murillo government’s violent repression of civic protest since April. Many of the injuries they have been treating are bullet wounds to the abdomen, requiring surgery, follow-up care, medication and food. We do not have sufficient words to express our gratitude for your gestures of solidarity with the people of Nicaragua. Without your solidarity and fraternal support, we would not be able to respond to the needs created by the various phases of the State’s violence and repression and be able to deliver assistance to the students who courageously remained barricaded at the UNAN, Managua, to the heroic people of Monimbó who continue resisting their criminalization, to the wounded of Matagalpa, Granada, San Pedro de Lóvago, Jinotepe, and to bring help to the brave Mothers of April who continue to demand justice for their daughters and sons who are imprisoned and disappeared. The level of criminalization grows every day, the persecutions, imprisonment of leaders, youth, students, campesinos, the fear that we live with, the forced disappearances, the massive firings of doctors who, faithful to their professional oath, provide medical care to the wounded and their families. Below are photos of supplies and operations your donations have funded. This crisis is not over. Your generosity and ongoing commitment to the work of these heroic doctors is saving lives every day. Because of your generosity we have reached almost 80% of our goal. It has become too dangerous for people living in Nicaragua, or people with families in Nicaragua, to post this campaign on social media. This has reduced our ability to spread the word. So now those of us in a position to do so must make an extra effort to help raise the last $3,250 needed to reach our goal. Just think, if each one of the 168 of us who donated recruits one person willing to contribute $20, we can meet our goal. Those of us who are able to give a little more than we originally did will also help move us closer. Please re-post this page on social media with a short personal note from you, encouraging people to contribute to this mission meeting our goal and supporting these brave doctors in their life-saving work. So grateful to you all that we are over 70% of the way to our goal! I, Ann Garvin, am personally withdrawing the funds and will be responsible for the distribution of the funds abroad. Keep spreading the word! Thank you and congratulations to each and every one of you. We are proud and happy to say that we have received donations from over 120 people, and are 60% of the way towards reaching our goal. We have added a Spanish version of the campaign on the GoFundMe page so that it can be shared with your Spanish-speaking friends and family members. This is a good time to redouble our efforts to reach out to all of our real world and virtual world friends and relatives, to let them know how important this campaign is and to encourage them to spread the word as well. Together we are helping to save lives. Thank you so much for all your help.